Acupuncture is part of traditional Chinese medicine. For thousands of years, it has been a reliable treatment for various ailments. During a traditional session, you might feel relaxed, euphoric or even fall asleep. After treatment, it is possible to feel tired. Several factors that might contribute to such tiredness. Acupuncture is based on the theory that meridians (energy channels) are connected to specific organs and body systems and that specific points (acupoints) can be stimulated (through needles or pressure) to restore or unblock the flow of energy (chi or qi). You can treat migraines, addictions, certain eye conditions, injuries, arthritis, stroke paralysis and manage pain with acupuncture. 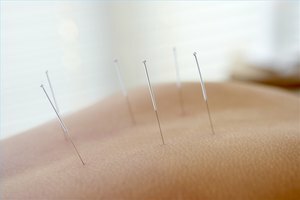 A typical acupuncture treatment lasts between 20 to 60 minutes. The number of needles inserted (12 to 14 at most) will depend on the conditions being treated and the skill of the acupuncturist. According to Dr. Nawei Jiang, owner of Nawei's Acupuncture Clinic, most patients are relaxed or fall asleep during a treatment. This is normal. Following treatment, you might feel energized, refreshed, relaxed, euphoric or tired. This will depend on how long you were in the acupuncture treatment. Being tired after a treatment is not harmful, but it is a sign that you need to rest and recuperate. According to Dr. Jiang, a licensed acupuncturist with a Ph.D. in traditional Chinese medicine, if a patient is really weak from a chronic condition, this could lead to tiredness following a session. Also, if you do not eat properly, fatigue may follow. Dr. Jiang suggests that you should allow your body to rest after an acupuncture treatment so it can heal itself. Acupuncture has been successful treating chronic fatigue syndrome (CFS). In some cases, fatigue is due to a blockage in the adrenal and kidney organs. Acupuncture can unblock these areas and improve a person's energy level.